The name baklawa covers a host of sweets made from phyllo pastry. They come in all shapes and sizes, can be stuffed with nuts or a sort of cream filling. 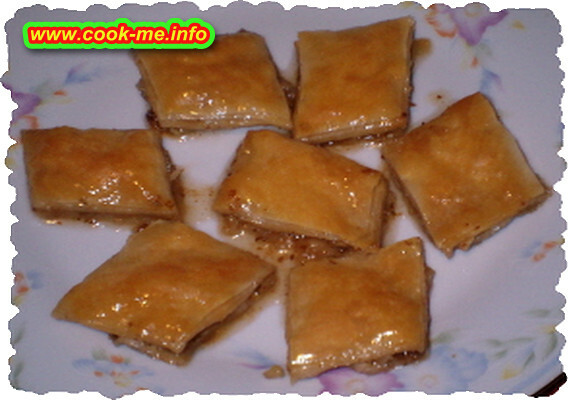 This is probably the simplest one of all of the baklawa to make. 1. Melt the ghee, but do not boil. I do it in the microwave, but you can just as easily do it on the stove. 2. Using a rectangular oven-proof dish that is approximately 9"x11" and at least 1 1/2" deep, brush the bottom with ghee. Place the first layer of pastry on the bottom of the dish, trimming it to fit. Brush the top of the layer of pastry with ghee, and cover with the second sheet. Keep going until you have 7 layers of pastry, each brushed with ghee, in the dish. 3. Mix the sugar, crushed nuts and cinnamon in a bowl. Tip the mixture out onto the pastry in the dish, and spread it out gently, using the back of a spoon. 4. Place the next layer of pastry over the nuts, and brush with ghee. Continue until you have used the remaining 7 layers of pastry. You must brush the top layer with ghee, also. 5. Cut the pastry into diamond shapes. Do this by beginning about 1" down from the top left corner of the dish, and cutting diagonally down to the right hand corner of the dish. Now make more diagonal lines by cutting parrallel to the first line, about an inch apart. Once you have a complete set of diagonal lines, make similar lines going from 1" below the top right corner, to the bottom left corner. 6. Bake at 180°C or 350°F for about 20 minutes, or until the top of the pastry is golden brown. 7. Soak with sugar syrup. remember the rule that either the syrup should be cold or the pastry, but not both.